IIS / Apache Log Analyzer is used to analyze Apache and IIS server log files and build reports on the webmaster's computer without the necessity to hand over commercial information (your statistics) to any third party service. Every report contains diagrams showing daily changes in report data (requested pages, referrers, search phrases, etc.). Log Analyzer: Trends is designed as a standalone application for the Windows operating system. To start working with Log Analyzer: Trends, install and run the application. After the installation the program shortcut is located in Start Menu / Programs / Log Analyzer. First of all, you should create a new project. To do it, select File / New in the menu or click the New button on the toolbar. 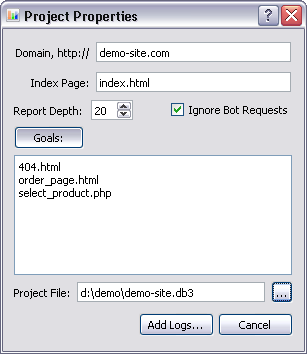 You should enter the domain name (without http:// at the beginning) and the name of the default page of the site in the Project Properties dialog box, choose a name for the project file and the folder where this project will be stored. You can also specify how many positions to analyze in each report (by default top 20 positions are analyzed). Then you can Add Log files to analyze. You can add Apache & IIS log files one by one or as a group. Log Analyzer: Trends understands both unpacked log files and log files packed in a .gz or .zip archive. To analyze log files, select the Add Logs... item on the File menu or click the "+" button on the toolbar. 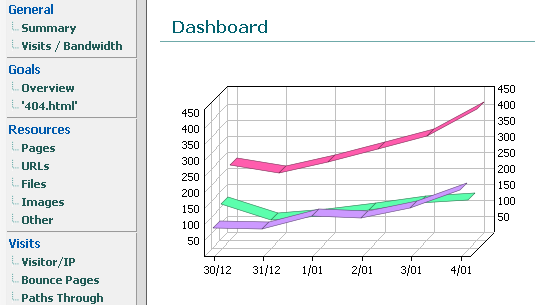 The progress of the log analysis process is shown on the status window. If necessary, you can stop the process by clicking the Cancel button on the progress window. After finishing the process of analyzing log files, Log Analyzer: Trends will offer you to view 24 standard reports including Summary, Pages, Referrers, Search Engines, Search Phrases, Browsers, Platforms, etc. To make navigation through the report more comfortable, you can find the list of all reports in the left part of the screen. A click on the name of the necessary report will take you to the required section.